In The Culture Code, author Daniel Coyle identifies two categories of skills workers possess – Skills of Proficiency and Skills of Creativity. He describes how these two skill sets help people solve different types of problems for organizations. If you are like me, you freely shift between these skill sets during a typical workday. Yet Coyle suggests organizations are more than just an inventory of skills. What really matters is how people interact with one another to leverage their capabilities. As architects, we’re focused on how spaces can support individuals and their interactions. When problems are well-defined, they have a single answer. To arrive at solutions, Skills of Proficiency are required, along with sufficient time and a place for individuals to concentrate. Individuals can work in series to complete larger projects, split into following tasks that can be assigned to different team members. Ambiguous problems are a different story. While you can converge on a single answer in a well-defined problem, there is no preordained path to a solution for creative solvers. Multiple paths must be taken, with no guarantees of success. 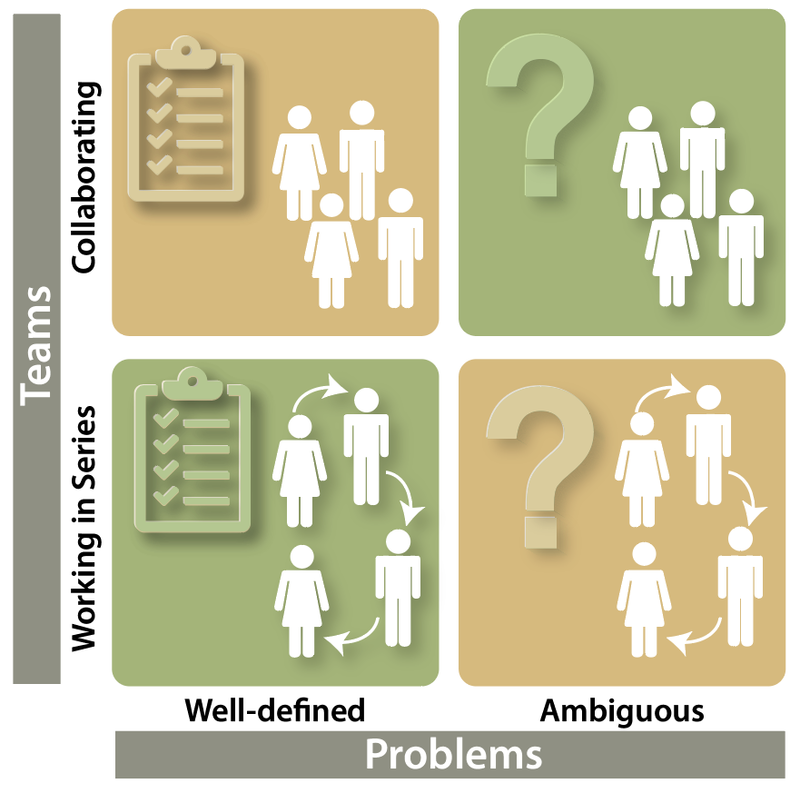 As Coyle suggests, groups can be particularly useful in solving ambiguous problems, since each member adds unique skills and perspectives in parallel. Coyle’s analysis provides a useful lens to look through when designing spaces that support problem-solving. On a more granular scale, MIT Professor Nelson Repenning and colleagues Don Kieffer and James Repenning recently published an article further interrogating this topic. In their analysis, they identified functional and dysfunctional arrangments for different types of problem-solving. Their study has significant spatial implications. In a four-square grid ubiquitous in business schools (pictured above), they plotted types of problems (well-defined and ambiguous) on the horizontal and types of teamwork (serial and collaborative) on the vertical. In their analysis, shifting modes along the two diagonal axes lead to radically different outcomes. 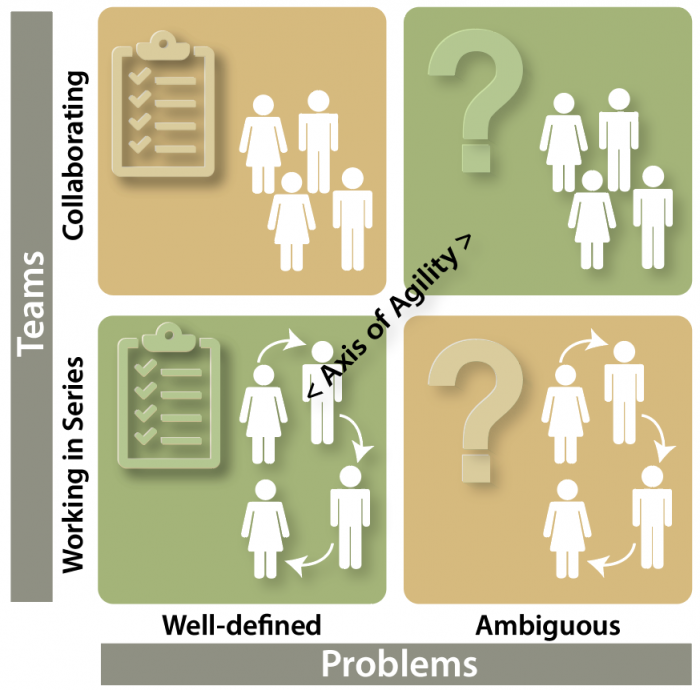 Along the “axis of agility”, people shift between collaborating on ambiguous problems in a studio environment and focusing on individual work, completed in series with others, when working on well-defined problems. The authors conjecture that organizations achieve the best results when they promote easy and frequents shifts between studio environments and individually focused ones. We extrapolate that problem-solving can be improved by designing spaces that reduce the friction between these two environments. Ideally, they are interlocked but designed to avoid disturbing one another. Either space should be able to be recruited quickly on an impromptu basis. Yet this sort of flexibility is not free since people have multiple dedicated places to do their work. But if the spaces are well designed for specific purposes, the redundancy will return outsize dividends that compensate for any loss of economy in space. These sorts of productivity gains are invisible in photographs but remain ever-present. 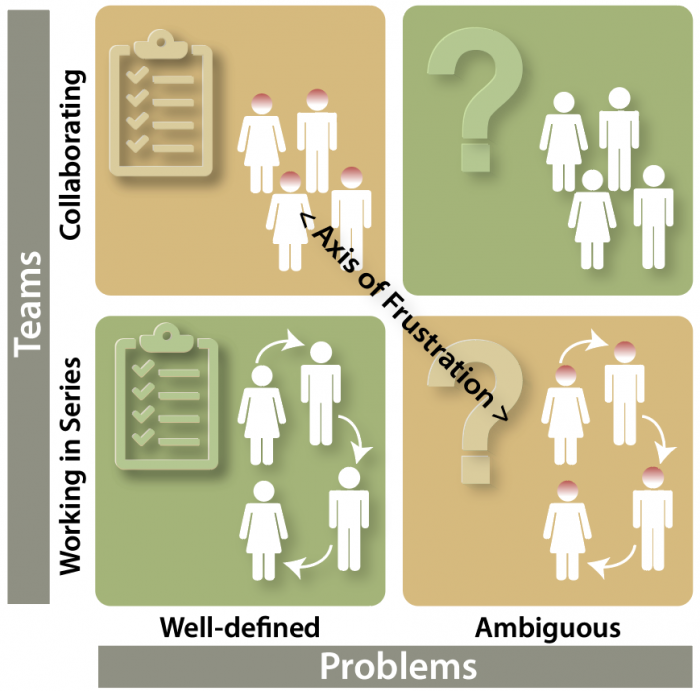 In contrast, the other diagonal in the grid is the “axis of frustration”, where people shift between trying to solve well-defined problems in groups and ambiguous ones in a step-by-step process. The former wastes everyone’s attention and the latter wastes everyone’s time by drawing out each iteration. In multiple types of projects, we see studio spaces emerging alongside individual workspaces that were not imaginable fifteen years ago. People move more and are more productive in these spaces. We’re even improving our own office design with new types of collaborative and individual workspaces. When viewing traditional education spaces through this lens, the frustration of an instructor trying to teach a cohort of unique individuals with the same step-by-step curriculum during a slot in a regimented schedule is understandable. When teachers are asked, as a group, to assess individual students, they’re on the axis of frustration, too. We are currently designing agile spaces for both education and business clients. Parallels abound. Both projects leverage a broad palette of spaces so their occupants can solve problems more quickly and effectively than ever before.